We are officially in winter mode. 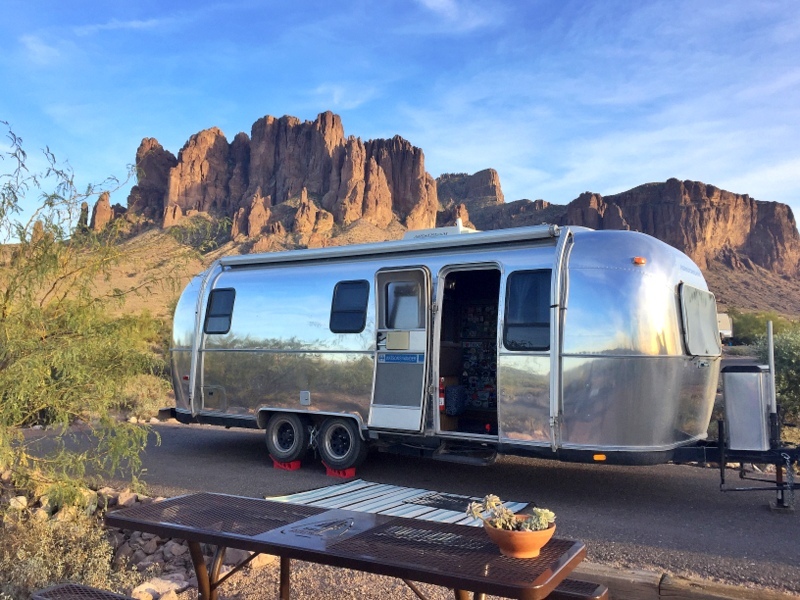 For us, that means longer stays in one spot, very little planning or making of reservations, fewer adventures, and more time spent at or near home. While this shift is not a conscious decision, when I look back on the last few winters it certainly seems to be the pattern we follow. After a long spring, summer and fall season of driving, discovering new places and seeking out adventure, the winter is when we slooow it down. Part of the slow down happens because our goal in the winter is to stay where it’s warm which limits our range of travel. The other part of the slow down is dictated by the short winter days. Fortunately, because Tim works on east coast time, here in Arizona we get to go out and play after 3pm. But that still only gives us a few hours of daylight which means all weekday activities must take place close to home. So instead of driving to a trail and hiking/biking for a few hours we instead have been exploring our immediate surroundings. 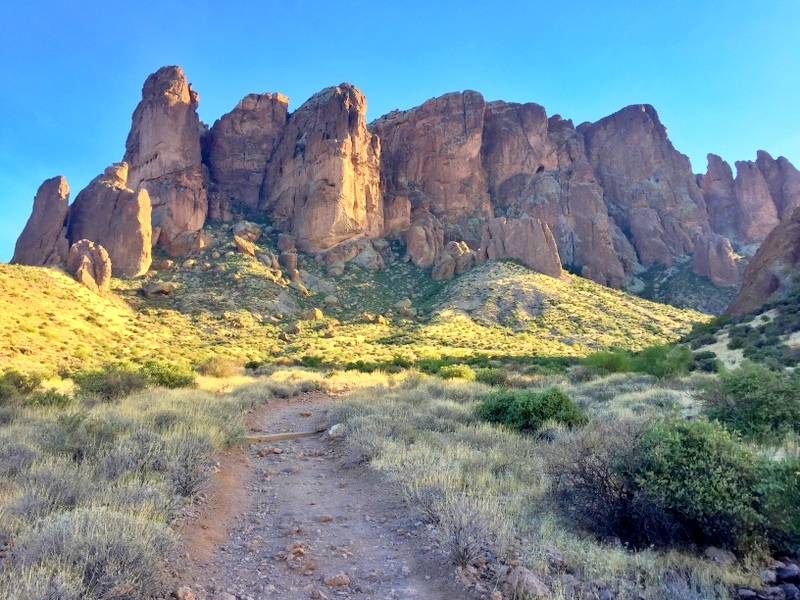 For the last two weeks of January, those surroundings were at a scenic state park on the far eastern edge of Pheonix called Lost Dutchman. 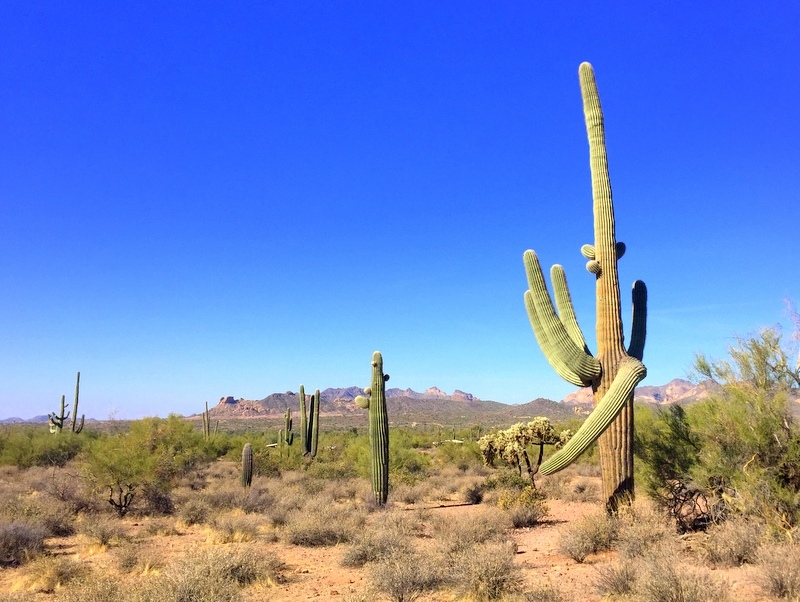 Tim had a work event to attend in Scottsdale and while Pheonix is far from our favorite city, it gave us a chance to return to a park that we have fond memories of from our last stay five years ago. 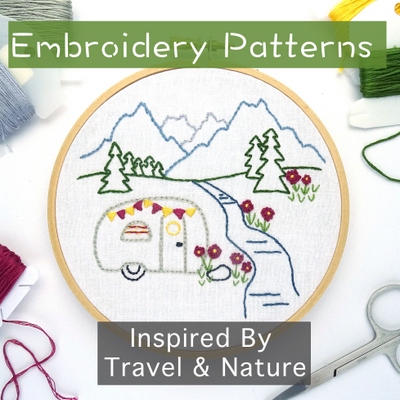 Since then a brand new dry camping loop has been added to the campground. 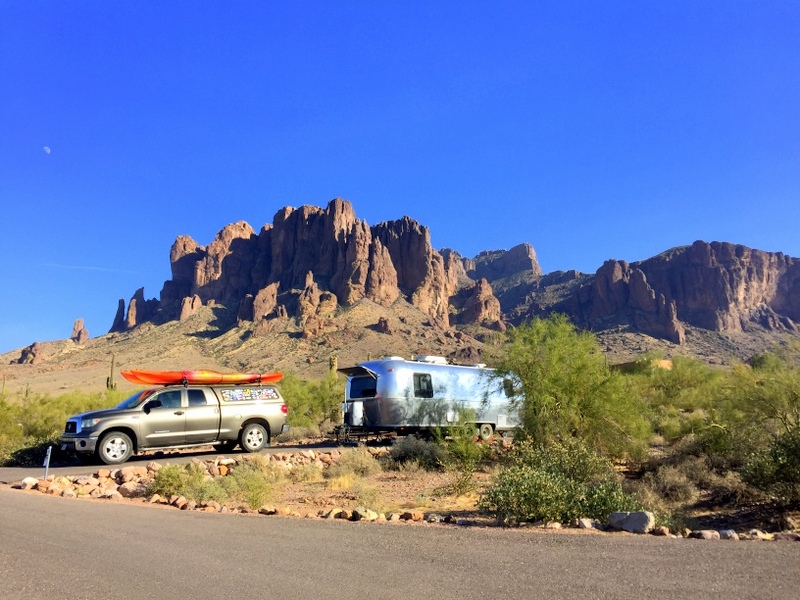 It was here that we snagged two different sites with great views of the Superstition Mountains. 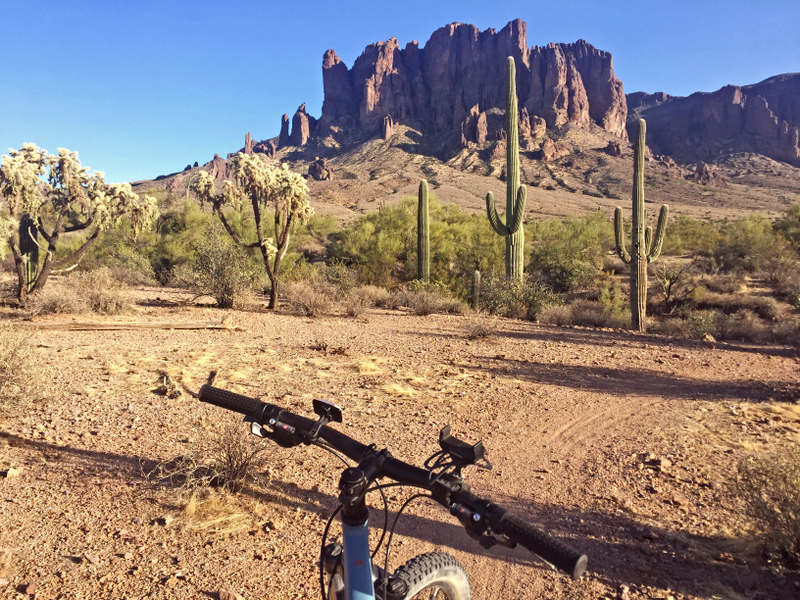 Lost Dutchman has a small network of hiking trails and one short single track mountain biking loop. 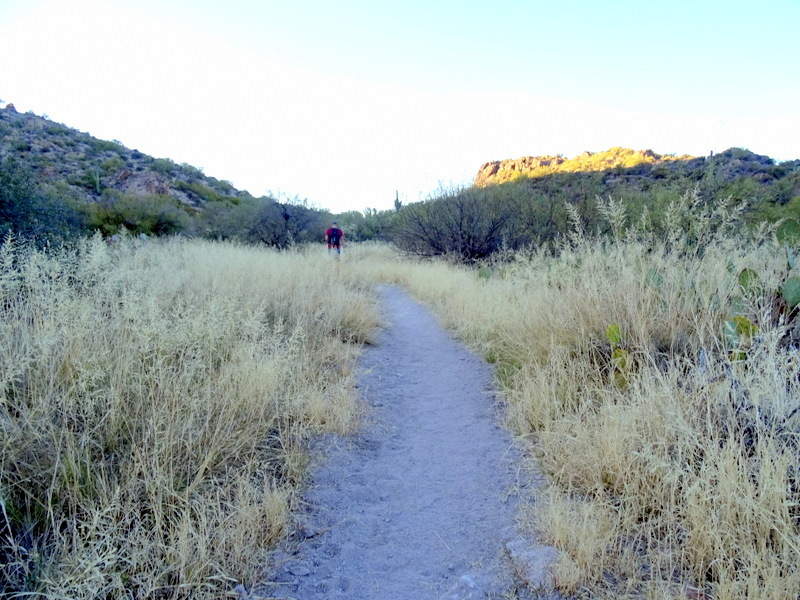 We hiked all the trails several times and did a couple loops on the bike trail. It’s only about 3 miles in total so you have to ride it a few times in a row to get a good workout. One day we drove a few miles down the road to Good Water trailhead for a quick afternoon hike. We also utilized our weekend days well with two challenging adventures. 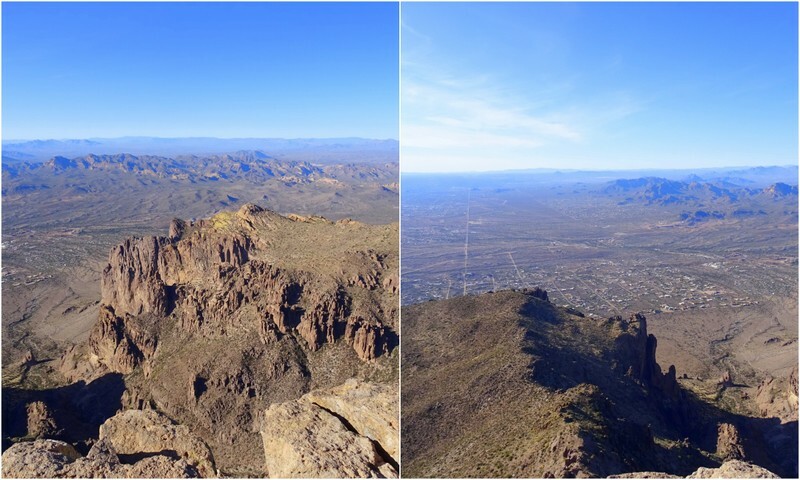 The first was to tackle the Siphon Draw trail to the top of the Flatiron. At only 5.5 miles round trip it’s not a terribly long hike, but with a 2,800-foot elevation gain, it sure is a steep one! Tim hiked this trail the last time we stayed here, but I wasn’t feeling well and stayed home that day. This time I was determined to get to the top. Even though it was exhausting I really, really loved this hike. 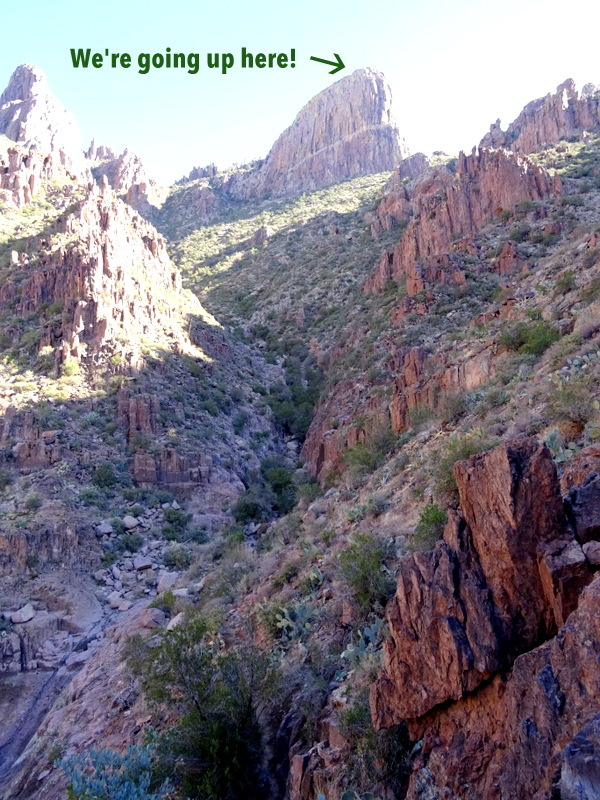 I think I’ve mentioned a few times lately that rock scrambling and rock hopping is often my favorite part of hiking and this trail has a LOT of that. 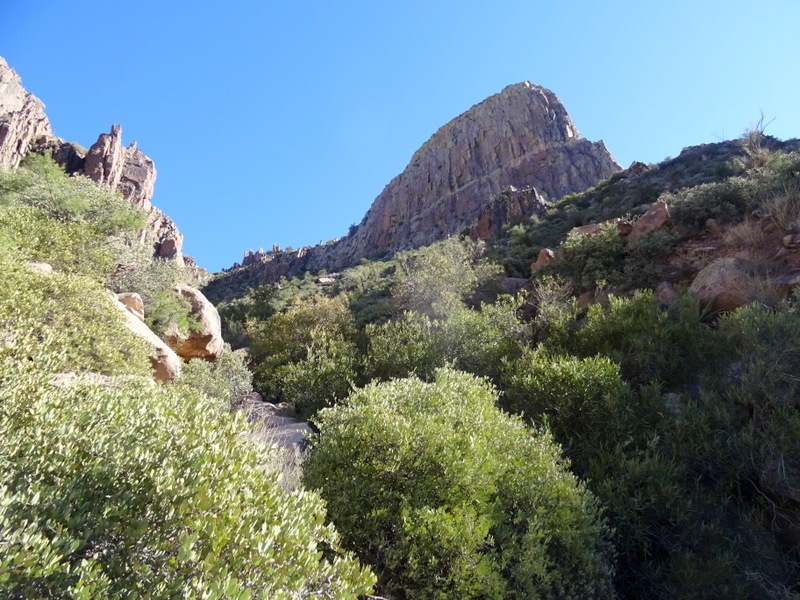 I really enjoy the challenge of a hike with a verity of terrain and some route finding. Both of which came into play on this hike although the latter was not very difficult. 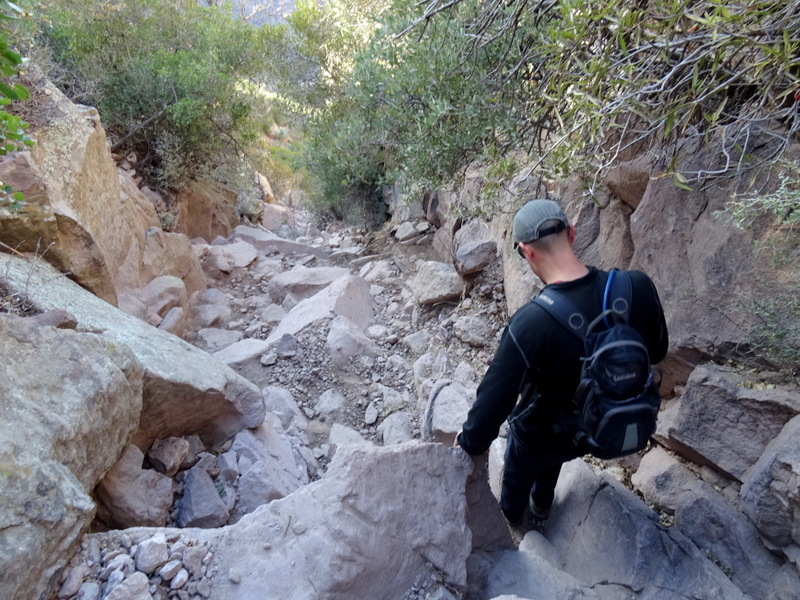 While the trail is not marked the whole way, its popularity means that a well-worn path to the top is fairly obvious and easy to follow. 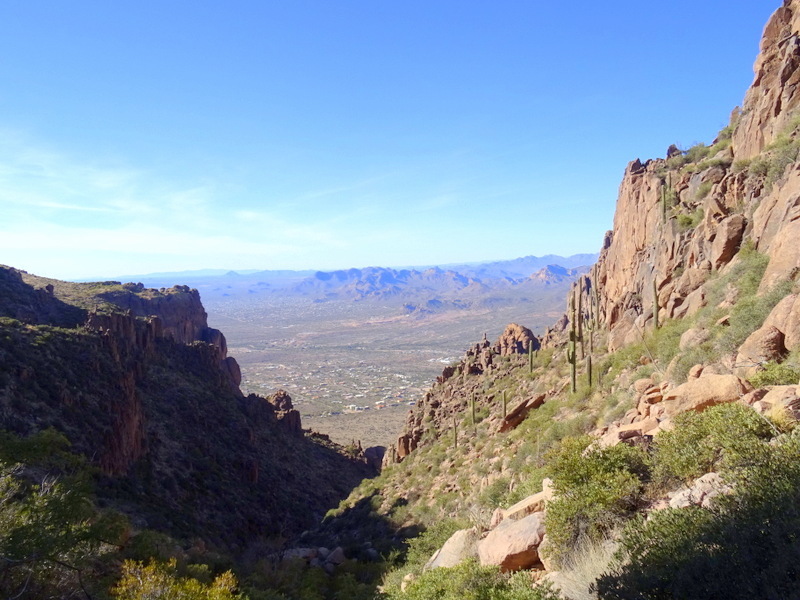 The steep terrain is hard on the body (gloves are a good idea for this hike) but I would definitely do this one again! 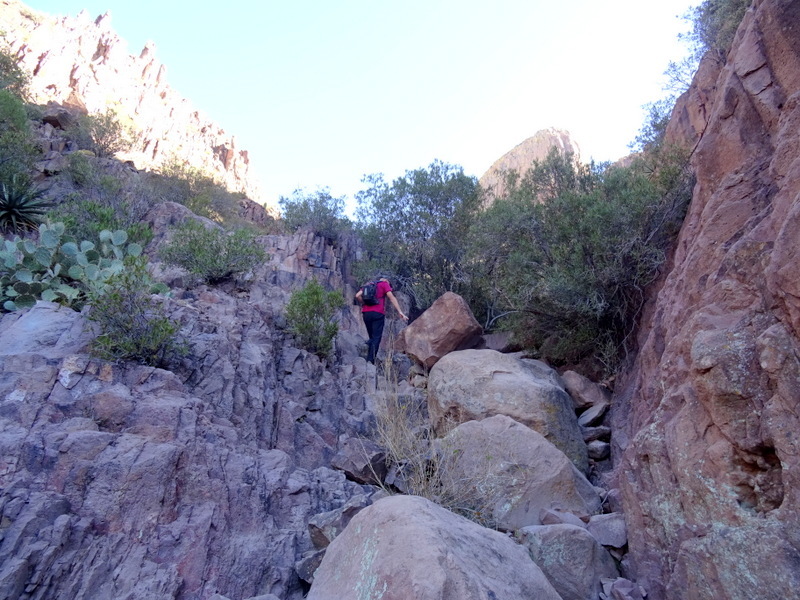 The only photo I took on the way down – I was too busy navigating the steep terrain. 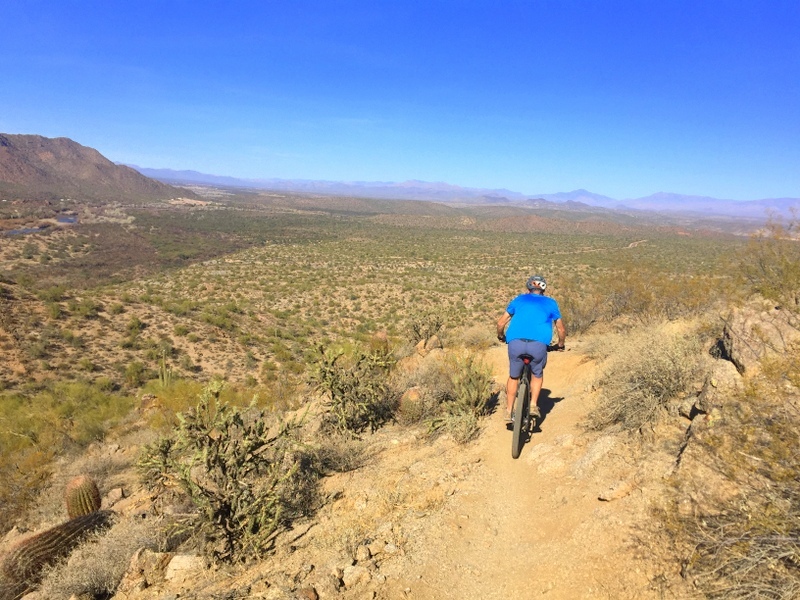 The next weekend we drove over to Mesa for some mountain biking. The trail system that we rode doesn’t seem to have a name but we found it on the Mtn Bike Project app. 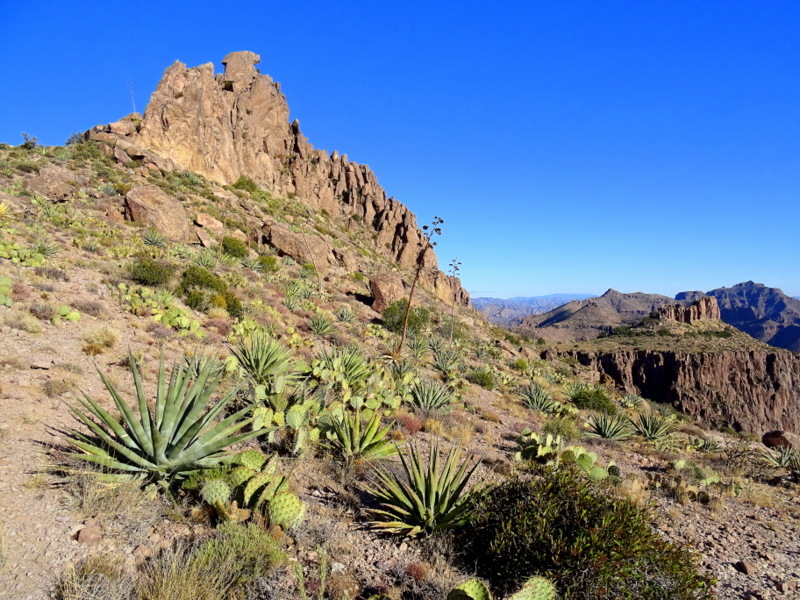 It’s not far from Usery Mtn Park (where we have stayed before and love). It seems to be used mostly by locals and even on a gorgeous Saturday we only saw a handful of other riders. 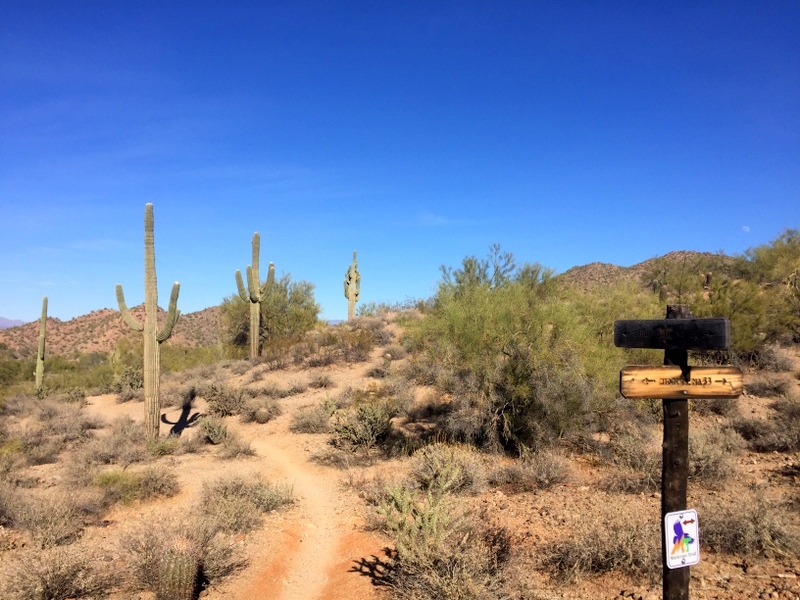 We tackled the Saguaro loop which kicked out butts with lots of steep grades and some very, very skinny track that often required squeezing between rocky outcroppings and spiny cactus. Needless to say, there was a fair amount of walking involved in this bike ride. In between getting outside for exercise, we (well, mostly me) drove around doing a ton of errands. Pheonix is kind of a ridiculous in that it takes more than an hour to drive from one side of the city to another. This means that unless you want to fight the traffic for hours, visiting stores close to your current location is a must. Not a problem if it’s a chain store because Pheonix seems to have a Target/Michaels/Fry’s/UPS store on every corner, but anything other than that and you’re in for a long journey. One afternoon we decided to visit REI so I could pick up some much needed new hiking shoes. It took us nearly an hour to get there and then because of traffic it was going to take over an hour to get home! Instead of sitting on the freeway, we did some more shopping and then found a cool little brewery for dinner. 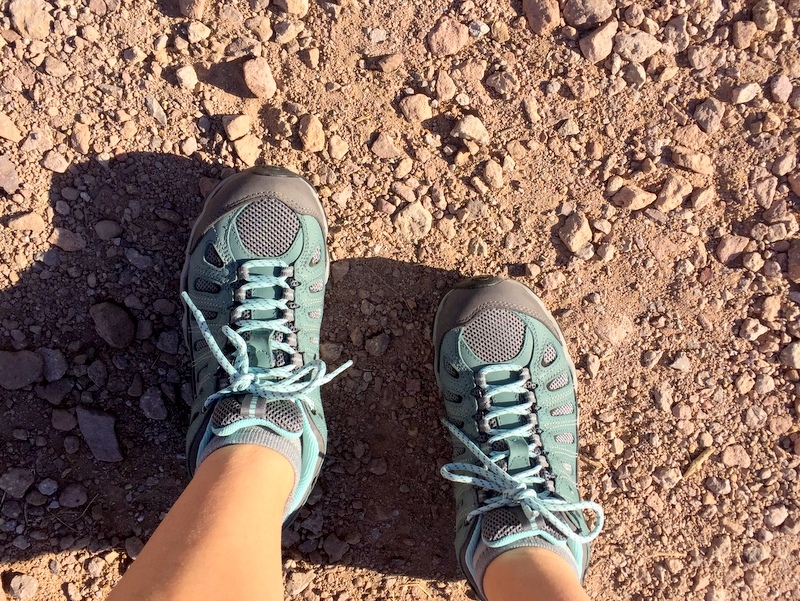 New hiking shoe success! I am loving my Oboz! We also got to spend an evening with our friends Dave and Kelly who showed up at the state park about a week into our stay. By some stroke of luck, they got a site right next to us. D & K were one of the first couples we met after we started full-timing and it’s always fun to catch up with them. And that wraps up our time in the city. With all errands complete, pantry and fridge stocked, and Tim’s work event attended, we pointed our wheels south in search of a patch of desert to call home for the next few weeks. Good for you for climbing to the top of Flatiron! 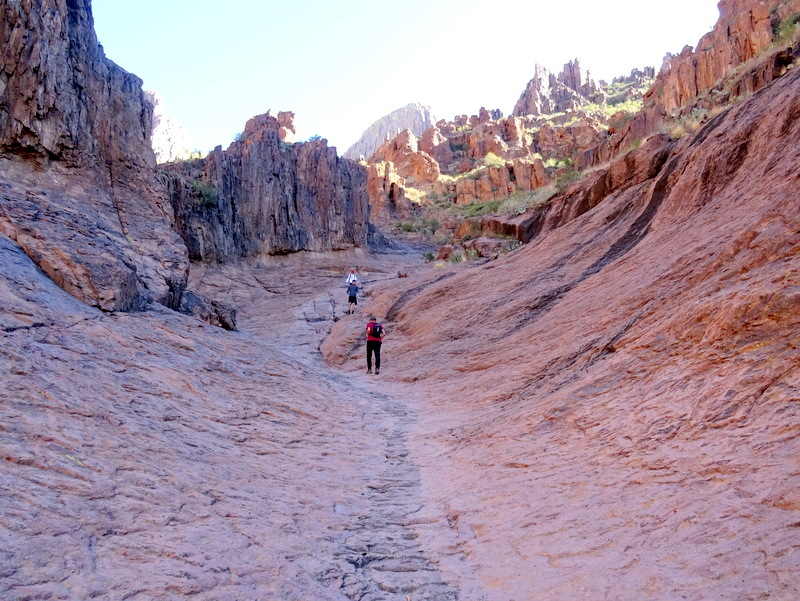 We turned around at the top of the Siphon…just too darn gnarly. All we could think about was how scary and hard on our joints it was going to be just going down what we had already climbed…let alone going all the way to the top! I’m an Oboz fan too! The way down might have been harder than up on this hike! This is my first pair of Oboz and I am in love. Have already taken them on several hikes with no break in period. Much better than my old Keens! Whoa…..Long time between posts, thought maybe you two were hibernating for the winter. That’s what happens in winter mode – less adventure means less to write about. We are enjoying Florida this year but still missing the desert. Already getting plans together for next year’s western winter. We have a new blog address for this Florida trip-i’ll be interested to hear how it is down near Ajo and Why. As much as I loathe the bugs and humidity that come with winter in Florida, I do miss all that lush vegetation and opportunities for Kayaking that we had last year. New blog post on Ajo coming soon!